Religious makeup of Palestinians: Most Palestinians are Sunni Muslim, although there is a sizeable and influential Christian population as well. Number of Jewish Israeli settlers living in the occupied West Bank and East Jerusalem combined: Between 500,000 and 600,000. Number living in East Jerusalem: Approximately 200,000. Since the Arab-Israeli war of June 1967, Israel has been militarily occupying the Palestinian West Bank, East Jerusalem (including the Old City), and the Gaza Strip, as well as the Syrian Golan Heights. Area A: Under nominal civil and security control of the PA, however the PA operates at the discretion of Israel while the Israeli military makes incursions into Area A on a regular basis. Area A comprises approximately 19% of the West Bank and is where most Palestinians live. Area B: Under nominal civil control of the PA with Israeli security control. Area B comprises approximately 21% of the West Bank. Area C: Under full Israeli military and civil control. Area C comprises approximately 60% of the West Bank and is where most Jewish settlers live. See here for UN map of Area C, and here for UN fact sheet on Area C.
"Palestinians face systematic discrimination merely because of their race, ethnicity, and national origin, depriving them of electricity, water, schools, and access to roads, while nearby Jewish settlers enjoy all of these state-provided benefits… While Israeli settlements flourish, Palestinians under Israeli control live in a time warp - not just separate, not just unequal, but sometimes even pushed off their lands and out of their homes." "Every attempt to keep hold of [Israel and the occupied territories] as one political entity leads, necessarily, to either a nondemocratic or a non-Jewish state. Because if the Palestinians vote, then it is a binational state, and if they don't vote it is an apartheid state." Israel maintains more than 130 Jewish settlements in the occupied Palestinian West Bank and East Jerusalem, with approximately 600,000 settlers, and over 100 illegal "outposts" (nascent settlements built without official Israeli government approval). Settlements are a violation of Article 49 of the Fourth Geneva Convention and are classified as illegal by the US government, the United Nations, and all major international legal and human rights organizations, including the International Committee of the Red Cross, Amnesty International, and Human Rights Watch. In total, Israel's settlement enterprise and related infrastructure cover approximately 42% of the West Bank. From the time that Netanyahu returned to power for a second term in March 2009 until July 2012, the number of Jewish settlers living illegally on occupied Palestinian land in the West Bank grew by 18% according to the Israeli Interior Ministry. In 2005, as part of the unilateral "disengagement plan," Israel withdrew approximately 8000 settlers from Gaza. However, according to international law, Israel continues to be an occupying power in Gaza because it controls all entry and exit, as well as Gaza's airspace and coastline. As of May 2012, more than 325 miles of the wall had already been built, at a cost of $2.6 billion (US). Once completed, the full length of the wall will be between 420 and 440 miles (according to the Israeli Ministry of Defense and human rights group B'Tselem, respectively) - more than twice the length of Israel's internationally recognized border with the West Bank. In July 2004, the International Court of Justice (ICJ) issued an advisory opinion deeming the West Bank separation wall illegal. The court said the wall must be dismantled, and ordered Israel to compensate Palestinians harmed by its construction. While the ICJ's decision was an advisory opinion, and therefore not binding on the parties, it is an authoritative statement of the status of the wall in international law. Eighty-five percent of the wall will be built not along Israel's internationally recognized pre-1967 border, but on Palestinian land inside the occupied West Bank. When finished, the wall, along with the settlements, Israeli-only highways and closed military zones, are projected to cover 46% of the West Bank, effectively annexing it to Israel. Critics have accused Israeli authorities of designing the wall's route to envelop as much Palestinian land and as many Israeli settlements as possible on the western, or Israeli side, while placing as many Palestinians as possible on the eastern side. In total, about 85% of the Israeli settler population is expected to end up on the Israeli side of the wall. The wall also surrounds much of occupied East Jerusalem, cutting its approximately 250,000 Palestinian residents off from the rest of the occupied West Bank. 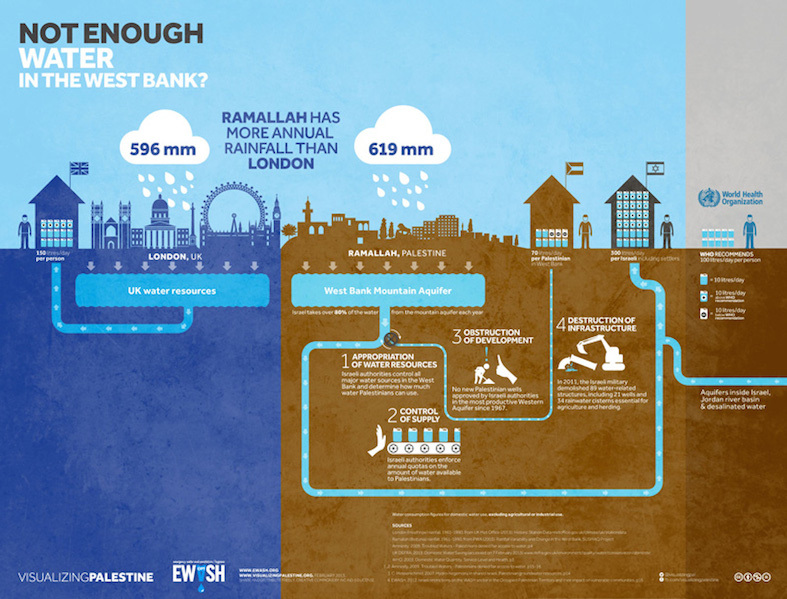 During construction of the wall, Israel has destroyed large amounts of Palestinian farmland and usurped water supplies, including the biggest aquifer in the West Bank. At any given time, there are approximately 500 Israeli army checkpoints, roadblocks, and other obstacles to Palestinian movement within the occupied West Bank, an area smaller than Delaware.